The Stations of the Cross is a series of images showing the struggles of Jesus Christ from his condemnation to his crucifixion. They are especially prayed during Lent and Good Friday. There are usually 14 images that are hung in order around a church or along a path. People walk from image to image, and stop at each "station" saying prayers and possibly reading scripture passages. This prayer is often held by groups or individually. Other names for the Stations of the Cross are the Via Dolorosa or Way of Sorrows, or, The Way. In Jerusalem, the Via Dolorosa is the actual path that Jesus walked, and the stations are the actual places where the events occurred. St. Francis of Assisi started the tradition of moving from station to station although it was practiced less formerly before. In Lent, and on Good Friday, this practice is very popular but it is also prayed during the year.The number of stations varied throughout history; Pope Clement XII extended to all churches the right to have the stations. Ultimately, the stations are an act of love towards Jesus to thank him for the great sacrifices he made for love of us and to atone for our sins. 15. Resurrection of Jesus is sometimes included as a fifteenth station. P/ We adore thee O Christ and we praise thee. C/Becuase by thy Holy cross thou hast redeemed the world. All: Holy Mother, pierce me thorugh, in my heart each wound renew, of my saviour crucified. Walking from Station to Station when making the Way of the Cross privately; when making it publicly, it suffices for the priest with the altar boys to do so. 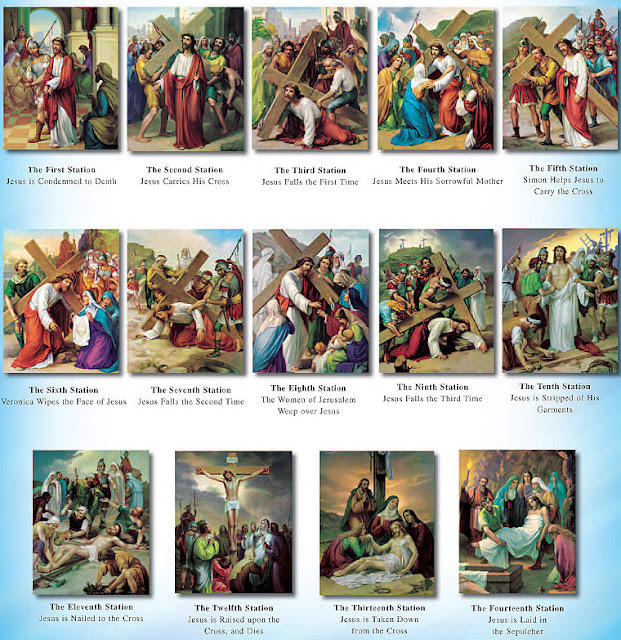 Meditate at each Station on the sufferings of our Lord.